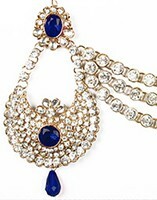 A Pakeezah Jhumar is a type of Asian hair jewellery which is a cross between a Jhumar or Passa (a traditional Pakistani hair ornament worn on the left side of the head) and a Matha Patti (traditional Rajasthani hair ornament with a tikka in the centre and chains draping on both sides of the head). 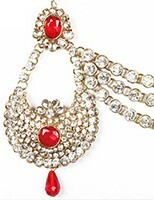 So a Pakeezah Jhumar is a single/multistraded hair-chain which is worn on the left size of the head. We are proud to say that it was Indian Jewellery Store who reintroduced this concept into popular culture by taking inspiration from the Bollywood classic film Pakeezah starring the gorgeous Meena Kumari.